WAILUKU — The Hana High School girls volleyball team knew what was on the line on Thursday at Jon Garcia Gym. Beat a tough Molokai team, and the night could end with a state tournament berth secure. 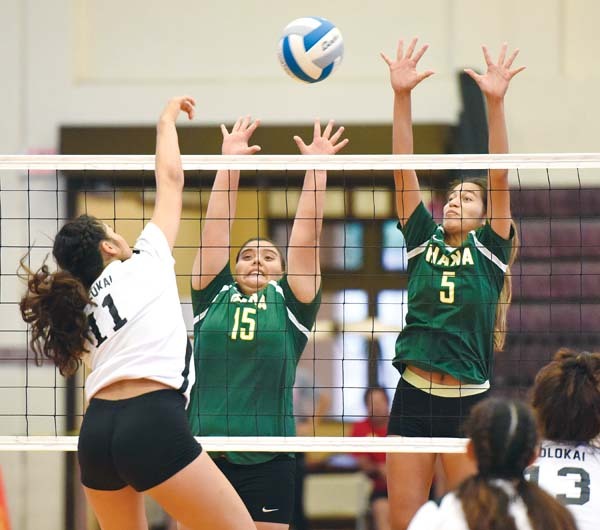 The Dragons accomplished their goal, first getting past the Farmers 25-18, 23-25, 25-20, 25-18 in a Maui Interscholastic League Division II tournament semifinal and then watching top-seeded Seabury Hall defeat Lanai. 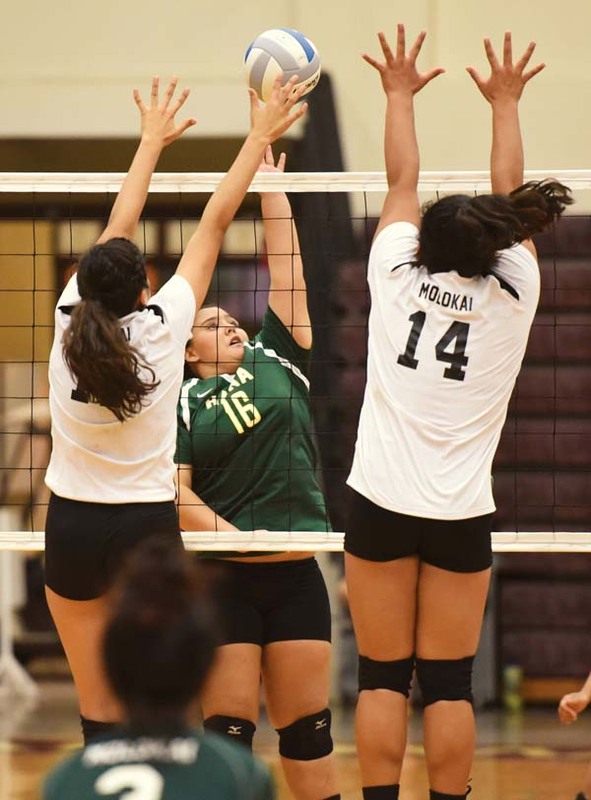 “I think that is really big because we work so hard to get to this point,” middle blocker Fushia Pua said after recording 17 kills, two aces and two blocks for the Dragons (11-2). Hana, last year’s MIL champion, must beat Seabury today to force a rematch on Saturday for the league title. The Dragons are the only MIL team to take a set from the Spartans this season, losing in five in both team’s league opener in August, and in four to finish the regular season last week. 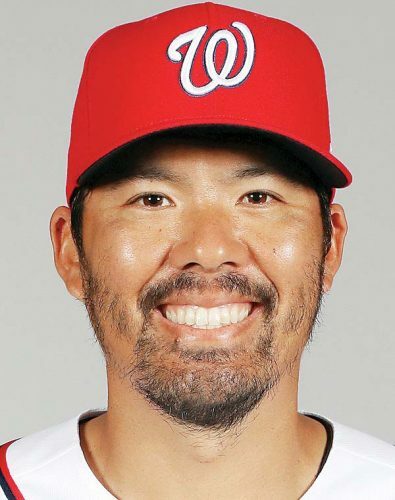 “I’m looking forward to it, a lot,” Pua said. After the Dragons rolled in the first set, the second was tied at 19, 20, 21, 22 and 23. A Hana error and Lorralynn-Shai Raw­lins’ block evened match. The third set was tied 10-10 before Hana scored 10 straight points behind the serving of Shaylee Roback, who finished with 42 assists, five aces and two kills. The Farmers (9-5) went on a 7-1 run to tie the fourth set, but the Dragons then ended the match on a 10-3 run. A kill by Nohokula Lind, who finished 14, along with four blocks, ended the match. Shya Roback added 11 kills for Hana. “They were very tough,” Lind said of the Farmers. Hana assistant coach Malu­hia Scott handled in-game coaching duties — head coach Kalunu Cantero recently injured her knee playing in an adult-league match. The Farmers’ Shaelyn McCutcheon had seven kills and 21 digs. Taye Mowat had five kills and 14 digs, and Kaitlyn DeRouin had 10 digs. “Everybody’s good in this league, it’s always a competitive battle,” Molokai coach Mahealani Rawlins said. D-II final: Hana vs. Seabury Hall, 5 p.m.
D-I final: Kamehameha Maui vs. King Ke­kau­l­ike, 7 p.m.
D-I overall championship, if necessary: Ka­mehameha Maui vs. King Kekaulike, 10 a.m.